Casualty makeup effects are fun to do and, if the right steps are taken, it is relatively easy to create something believable. Rushing in and banging on a bit of blood or some bruise gel without really thinking about it is OK for Halloween, but when creating a casualty makeup effect for a film or TV production, a bit more thought and preparation should go into it. A badly executed or out-of-place casualty effect catches the viewer’s eye – and makeup should never be a distraction to a scene. There is lots of accurate information out there. We like medical and forensic science books as they have accurate pathology, lots of background information to all sorts of injuries and great (if sometimes slightly disturbing!) photographs to illustrate. Injuries and illnesses have a natural progression from onset to recovery, and even things like shock have stages to them. Use reference pictures, but know exactly what you’re looking at. A picture has far more value if you know a bit about it like how old the injury is, where it is and how it happened or what caused it. 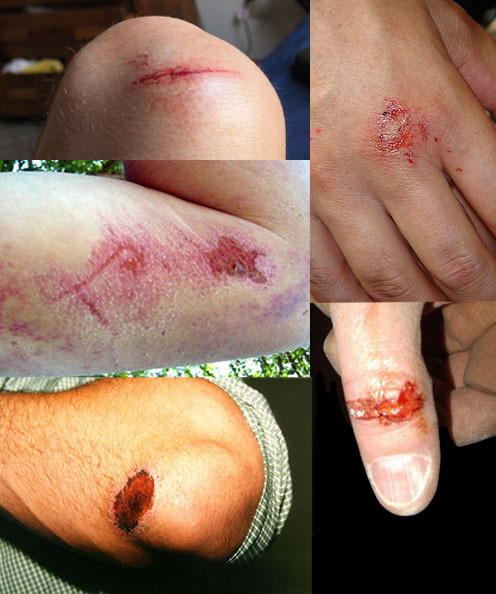 Collect a whole range of pictures of the same type of injury (like the grazes shown in the pictures left) so you get a more rounded view of how that injury can look on different people (skin tone, age etc.) and parts of the body. It will also show you the normal characteristics of that type of injury and not just the damn right bizarre. Also, collect pictures on how each injury heals. Build up a casualty effects library, ready for reference action if you get called upon to create something at the last minute. Take pictures of your own or friend’s injuries, recording how it heals on a daily basis. It is often not just about the initial injury – storylines continue and an injury goes with it. An injury happens to a character at a certain point in the story for a reason. Think about all the factors that resulted in the character becoming injured – the “who, where, what and why” – and consider what happens after the injury has taken place and how it will progress for the rest of the story. Sometimes the script gives a description of how the injury looks and, of course, the head of makeup should have spoken to the director about their visualisation/wishes. All this contributes to the final makeup as well as solid research. Have a complete script breakdown for each character and note how any injury progresses with the story’s timeline. Use your reference pictures. Liaison between departments is essential for some injuries in order to achieve a coherent casualty effect. For example, if the script indicates that a character is, say, bleeding profusely from the nose, where could that blood end up? Blood is indiscriminate, affected by gravity and movement, and does not stop graciously at the jaw line. If a character has a bloody injury yet their costume is squeaky clean and untouched by the sticky red stuff, or if props/the set has not a splash of claret anywhere, it might not look right. Burns, dirt and blood do not stop at the neckline or avoid furniture and floors. Talk to other departments. Sometimes aspects of an effect have to be completed in situ. Say the character is laying on the floor with a fresh, heavily bleeding cut on their head. There’s no point putting runny blood on them in the makeup trailer when gravity and the position they are in means the blood runs in a different direction to how it would when someone is lying on the floor! Let the AD department know that you need time to complete the makeup with the actor in situ. Know when to stop. Some casualty effects go astray as people get carried away, throwing blood, dirt or bruising around like the apocalypse is coming. An injury is the result of damage to the body and it doesn’t always manifest itself in a sea of blood or endless solid purple bruising. Subtle shading, a dab of texture, a stipple of colour or a hint of redness can often look more realistic and less like the character fell into a pot of jam -remember, it is all in context with the acting, set, props, costume and storyline. Makeup has friends and is not alone in creating the full effect! You can always add more makeup, but it is a big deal to take it off! If you’re not sure about how it will look in situ, start with less and check the makeup on camera/monitor. If something isn’t registering as you want it too, add a touch more. Words from training days back in the dark ages, but still relevant today. Picture a cheese and tomato pizza… mmm… Each round of juicy red fruit and that sinfully delicious yellow fatty stuff is laid in a pattern to ensure that the whole base is covered with the crust left bare. It is fairly uniform with a clean bit around the edge. However, we do not want a pizza – we want something random. Think random. We do not generally want order and uniformity for casualty effects.Blood does not disperse itself in equal proportions. It does not arc perfectly when allowed to spurt free, cunningly avoiding the shirt and hairline. If someone fell in a thorny bush, they would not have equally spaced grazes of exactly the same length forming a pretty pattern. They are not a pizza! Choice of products (and tools) is important when creating effects for film and television. Not only are the pigments/colours and textures better suited to the injury (e.g. a bruise wheel has yellow, red, purple and green: perfect for all stages of a bruise), but you have to think about how long it needs to be visible and under what filming conditions, and if it has to be replicated on future filming days. Use the right type of product for the injury e.g. if you are creating a fresh deep cut, use a runny blood that is the colour of fresh blood, not a congealed blood or a scab blood. 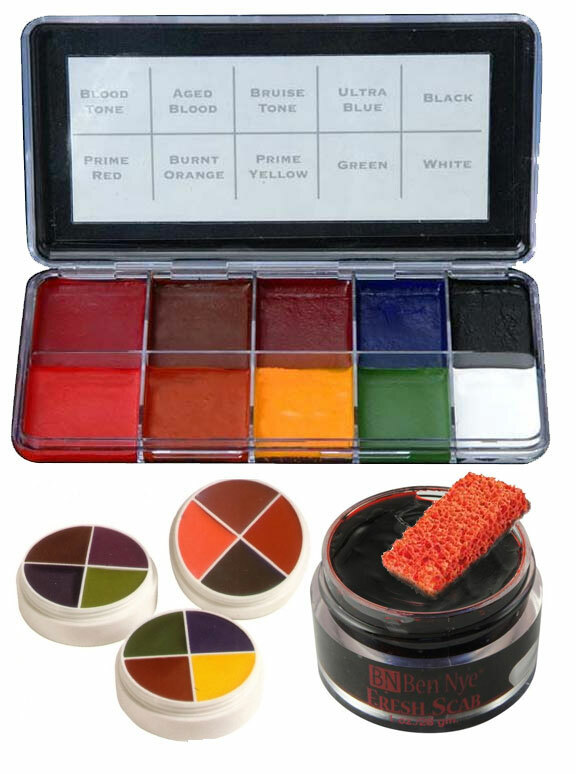 There are alternatives to special effects makeup products – we’ve made our own blood, slime and ice when on a tight budget – but you have to know how it will appear on the skin, including its texture and colour, and how it lasts. Technology can impact on makeup. Different cameras, films stocks, lighting and filters can affect how colours look in particular . For example, high definition picks up on reds and, because of the clarity of the image, picks up on edges, and poor colouring and blending. All makeup should be safe to use and carrying out a skin test is always worth doing to ensure someone is not sensitive or allergic to an ingredient/product. Barrier creams are useful. So you’ve done an amazing casualty effect based on solid research using photographs of actual injuries, checked it from all sides and watched the monitor. Now you just have to take pictures from all angles, not just front on, for the continuity notes. Actors are seen from all angles/sides and taking good pictures from all round will help you to recreate the injury on future filming days. 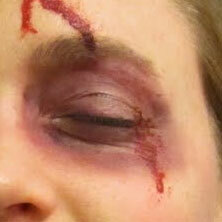 Do you know of a databases or catalogue of reference pictures for casualty make-up? We don’t know of any one online resource. A variety of research has worked for us, e.g. Googling the injury and using reliable sources like medical/forensic books (can be pricey to buy!). If you do find a database or something, please let us know!